In 1967, Louis Price, Leonard’s Father-In-Law, Provided Leonard And His Patty, The Opportunity To Return To Jamestown And Run the Family Ranch Formerly Known As The Price Ranch and Currently Known as Brooks Ranch. The 7,000+ Acres Has Been in Patty’s Family For Over 100+ Years. They, Along With Some Family Members, Immediately Went To Work Improving The Native Grass Pastures And Availability Of Stock Water, Updating The Genetics And Rapidly Increased The Carrying Capacity For Their Expanding Cow Herd, Yearling Operation, And 100+ Broodmare Band. 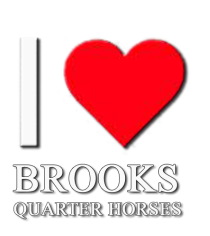 50+ Years Of Breeding, Brooks Quarter Horses Became Bigger Than Life. Leonard Explained To Son Lee, A NCHA Non-Pro Futurity Finalist, That He Had An Attraction To Horses Since Boyhood. As Early As The Sixties, Leonard Always Had “A Few Mares”. Brooks Quarter Horses, Sometimes With An Inventory Over 250+ Registered Horses, Was Never A Mere Business For Leonard, But It represents His Life’s Work. The Ranch Provided An Ideal Environment, The Horses Were A Necessary Part Of Their Cattle Operations, And The Cattle Were Used In Training , As Well As Being His Lifelong Passion. The Horses Are Raised As Practical As The Cow Herd, Bred, Foaled And Raised Outside In The Rolling To Steep Native Grass Pastures. The Purchase Of AQHA Race Horse Bar The Door (Own Son Of Three Bars) From Schwabacher’s Quarter Circle 5 Ranch Was A Precursor To Buying Plumb Dry That Leonard Developed Into The 1984 NRCHA Snaffle Bit Futurity World Champion. After Futurity Headline In Quarter Horse News "IT WAS PLUMB DRY IN RENO THIS YEAR." “Plumb” Sired Over 500+ Foals Including Lee Brooks’ Cutting Horse Plumb’s Sensation With Earnings Over $80,000+. Own Sons Of Smart Little Lena, Dash For Cash, Peppy San Badger (‘Little Peppy’), And Most Recently Tapgun(Playgun x Tap O Lena) Were Bought To Use In Brooks Ranch’s Unique Pasture Breeding Operation. In 1979 The Brooks Family Built A Large On-The-Ranch Enclosed Horse Complex Consisting Of Stalls, Pens, And Indoor Training Facility. They Hosted Cuttings And Cow Horse Events As Well As Their Production Sales And Daily Training In The Building. Not Long After Plumb Dry Won The 1984 Snaffle Bit Futurity World Championship, Leonard Experienced A Major Health Scare, prompting Patty To Encourage “A Rapid Down Sizing” Of Their Cattle Operations. “Leonard Was Twenty-Years-Ahead Of The Times” Echoed Son Ronnie And Longtime Friend Bob Barrett. He Had The Advantage Of Having Observed Many Successful Ranches, Packing Companies, And Feed Yards Throughout The United States. Leonard Took The Best And Innovated The Practical Application To The Changing Times. Against “Conventional Wisdom”, Leonard Went To Fellow Cattle Feeder Sam Mcelhaney In Arizona And Over Time Bought 100+ Charolais Bulls. “When They Delivered The First Charolais Sired Calves To The Community Corrals, After Weighing The First Two Drafts, Even Leonard Thought There Must Be Something Wrong With The Scales. Word Of The Brooks Ranch “Big Buckskin Or White Black-nosed Calves” Got Around. Some Of The First “Brangus Super Baldies” In The West Wore Brooks Ranch’s I HEART Brand. By The Mid-Seventies Leonard And Patty Had Over 4,000 Cow-Calf Pairs And 135 Mares. Even By 2011 Standards, That Was A Sizeable Operation. In Order To Accommodate Their Increased Cow Herd And Broodmare Band, The Need For Summer Pasture To Balance The Ranch’s Strong Native Feed, Leonard And Patty Leased Several Ranches Including Double Diamond Ranch In Reno, Nevada, Simpson Ranch, Bridgeport, Ca (Most Recently Owned By John Ascuaga), Kelsey Ranch, Merced, Ca, Rodden’s Circle Bar Ranch, Oakdale, Ca As Well As Utilized The Family’s Mountain Ranches In Hull Meadows. They Were Probably The Last Ranch To Trail Their Cattle To Lee Price Camp, Crook Ranch And Jaw Bone. Leonard Was Always “Up For The Challenge” He Demonstrated Many Times That “Necessity Was The Mother Of Invention.” In The Spring Of 1964, The Fed Cattle Market Threatened To End Their Cattle Feeding Business. So He And Patty Opened Their Own Butcher Shop To Retail The Cattle They Had On Feed At Kern County Land Company. Full Page Ads In The Bakersfield Californian Launched Stockdale Meats “We Feed Our Own Cattle...Selling Only American USDA Meat” (Documented In A 1964 Western Livestock Journal Editorial) He Was Always Aggressive In Solving The Lack Of Feed, And In Later Years He Was Able To Solve Most Market Challenges By Enlisting Marketing Stalwarts Ellington Peek Or H. ‘Skinner’ Hardy. Admittedly, The Only Real Problem That Leonard Couldn’t Improve On Was The Weather. Leonard Served In The Marine Corps During World War II. He Worked For The Rudnick Family At Their Feed Yards And Piute Packing Houses In Bakersfield And Modesto. His Livestock Education Included Working With H. ‘Skinner’ Hardy’s Father, Col. Harry T. Hardy. He Is Survived By His Wife Of 51 Years, Patricia Price Brooks, Sons Ron (Gerry), Lee (Miriam), Daughter Eileene Dambacher (Jim), Stepson Price Mailloux (Barbara), Stepdaughter Deniece Mailloux (Audi Rice), And Numerous Grand And Great-Grand Children. Predeceased By His Parents Munsel Brooks, Mother Jesse Jackson, And Sons Rod Brooks And Robert Brooks.